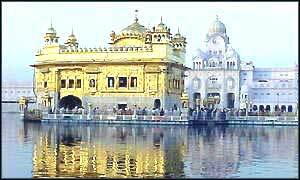 The Golden Temple stands as one of the most visited tourist attractions in the city of Amritsar. On your tour to India you will thoroughly like your visit to the city of Amritsar as it offers itself as a religious as well as a major tourist site. One of the several tourist attractions in Amritsar, the Golden Temple is visited by several travelers from various parts of the world. The Golden Temple history is one of the several areas that the tourists would love to explore. Even before the main shrine of the Gurudwara was laid, the pool had already been bordered with bricks under the supervision of Baba Budha ji. Guru Arjan Dev, with the principle intention of propagating the ethos of Sikhism, built the structure in sheer burnt brick and lime. Much later, during Maharajah Ranjit Singh’s reign (1799-1839), the temple was renovated and made into an architectural masterpiece, displaying a major sense of affluence along with, of course, the deep spirituality of the Sikh religion. The history of Golden Temple says that the land for the site was acquired free of charge from the zamindars (landlords) of local villages. Exhibiting influences of both Hindu and Muslim styles of design, the Golden Temple architecture significantly flaunts a large dome of gold. Positioned in the center of the city of Amritsar, the 40.5 square feet Golden Temple balances itself on a 67 square feet platform. The bridge escorting you to the temple is linked with the 13 feet broad ‘Pardakshna’ or circumambulatory path. Winding around the main temple it reaches the ‘Har ki Paure’ (steps of God). On the first floor of ‘Har ki Paure’, there is a continuous reading session of Guru Granth Sahib. Guru Arjan Dev planned and executed the compilation of the Sikh scriptures: a collection of the teachings, thoughts, hymns, and verses of the first five gurus of the Sikhs, and scholars and saints of Hindu and Muslim like Kabir, Namdev, Ravidas, and Sheikh Farid. Your visit to one of the greatest tourist attractions in Amritsar as well as in India will leave you with amazing sense of peace and tranquility, along with a feeling of self realization and spiritual emancipation.